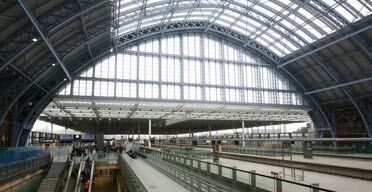 From 14 November 2007, Eurostar services to Brussels and Paris depart from St Pancras International. The station building is a wonderful mix of Gilbert Scott’s gothic extravaganza, Barlow and Ordish’s train shed repainted sky-blue and the new modern concrete structure. and secure facilities for cycles? 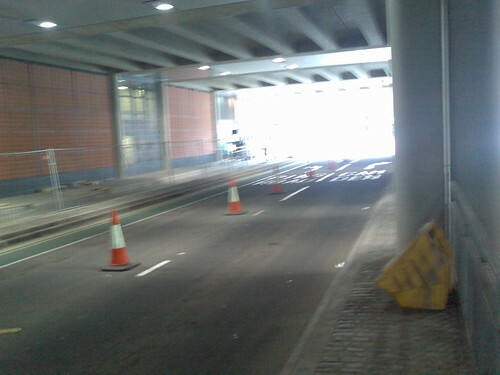 Camden Council and CCC agreed that the lead-in lane should be offside, or failing that, non-existent. However, it was implemented on the left – luring unsuspecting cyclists into the danger zone. We were told that the Act specified a lane on the left – but did they have ASLs in 1996? Camden Council promise to move it over when they get the road back from CTRL – but will that be too late? Olympics and the high speed Javelin service to the 2012 games. and hospitality destination for London. 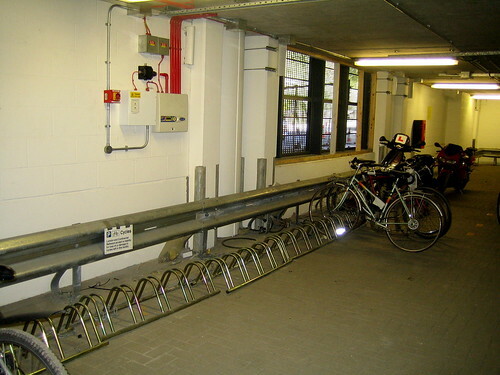 cycle stands in the adjacent streets. preferences studied than for any British railway station. If anything is breathtaking, it is the hyperbole rather than the “retail experience”. On hearing of the planned demo, cycle stands for 100 bikes were erected in the Car Park in time for 14th November with a promise to install more as soon as they become 80% occupied. On 3rd November, a new one-way system around St Pancras International will open. Midland Road will re-open to southbound traffic and Pancras Road from Euston Road to Goodsway will re-open to northbound traffic. This gyratory will cause cyclists to make long detours in trying to access or get away from St Pancras and Kings Cross Stations. Midland Road has been reopened with 3-4 lanes southbound at the junction with Euston Road and with no provision for contraflow cycling. This is not for lack of asking: since the late 1990’s, CCC has been campaigning against making Midland Road one-way. Buchanans Report for TfL on “Kings Cross Area Modelling”, June 2005 failed to take account of cyclists – in fact, cyclists were not mentioned even once. CCC studied Buchanans report and made arguments based on estimates of traffic flow that Midland Road could accommodate contraflow cycling The Judd Street one-way scheme and Midland Road. This is shown as “Link 2” on our access map. This link would allow cyclists to travel between Route 6 in Ossulston Street and the entrances to Thamslink and Midland Mainline Stations via Brill Place. This works southbound but would require a contraflow in Midland Road for northbound access. The need for this link was expressed in the section on Stakeholder feedback but the link is not recommended. At a meeting on 7th November Camden and City Cyclists urged Camden Council officers to implement this link. 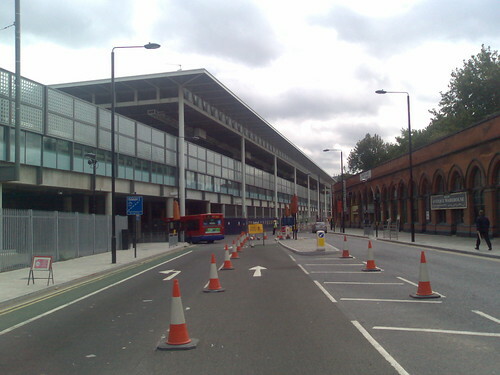 Cyclists have been promised two-way access in Pancras Road, but in August, Camden Council published a traffic order specifying that Pancras Road will re-open to northbound traffic. The council confirmed that southbound cycling would not be allowed until 2011-12. But after a meeting, it was conceded that cyclists could use the taxi lane to travel southbound. This was confirmed by a traffic order. Minutes of meeting with Laurie Baker (Oct 2005). despite it having been cyclable for a number of years. The lack of a sign here has led to a new incorrect sign at the junction of Marchmont Street that directs westbound cyclists to go to the stations via Euston Road. page about the spur from Route 0.
a sign from Islington along LCN+ route 7: it directs cyclists around the notorious King’s Cross gyratory rather than the quiet cycle route along Copenhagen Street. now been altered to contraflow cycle track to be implemented at an uncertain date in the future. now has examples of cycle-friendly infrastructure to match the best. a car hit a cyclist while the junction was being inspected. as tandems and recumbents won’t fit into such bags. Paris/Brussels for 24 hours before you can go further. Furthermore, this costs £20 each way when tickets start at £59 return. On hearing about the demo, Eurostar promised that from early 2008, it will be possible to book a bike onto a particular train so that you can travel with your bike. 250 cycles is needed initially and to be expanded when necessary. latest with no timetable slippage. City Cyclists notes on cycle parking at stations. Signage of route in both directions between the Stations Circular and St Pancras within three months. Improvements to the spur within six months. inside all parts of the station. NB First Capital Connect who operate Thameslink are already committed to doing this. 15km/h (10mph) by way of comparison. within one year for all long distance rail travel. Eurostar to give greater emphasis on its website to cycle hire than it does to car hire, particularly on its front page where its encouraging of driving is in sharp contradiction to its claim to be green. 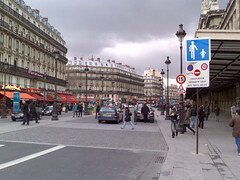 Look at the photo to see how the public space has been transformed at Paris Gare du Nord : quite different from the 4-lane one way gyratory on Midland Road!. Although far from ideal Gare du Nord has cycle parking for 90 cycles although these are not secure. We hope to organise a joint demonstration with Provelo at Brussels Midi and Velorution at Paris Gare du Nord. At Brussels Midi a bike station with space for 300 cycles has been promised since 2000. However it is clearly not a priority for Infrabel, the Belgian answer to Network Rail, which is instead building parking for 1650 cars.